But there has been a lot of discussion online about this camera and setting. And it perhaps gives rise to a wider discussion about later fixed focus basic camerasWhat isn’t in dispute is that this a pretty basic glass lenses fixed focus shooter with a 38mm 1:3.5 lens. Haking made 2 branded versions with the Halina Micro 35 but also the Haking Micro SC as well as versions for others like My Revue 35FC and in the US the Ansco 2000. There doesn’t appear to be any light sensitive exposure control beyond a low light sensor which turns on flash. I’ve detailed the spec on the original review but the consensus is that it uses a fixed shutter of 1/125 and the film speed switch adjusts aperture which is fixed for a certain film speed. As 400 iso will have therefore the smallest aperture not surprisingly shots best with 400 iso given the benefits of a bigger depth of field. 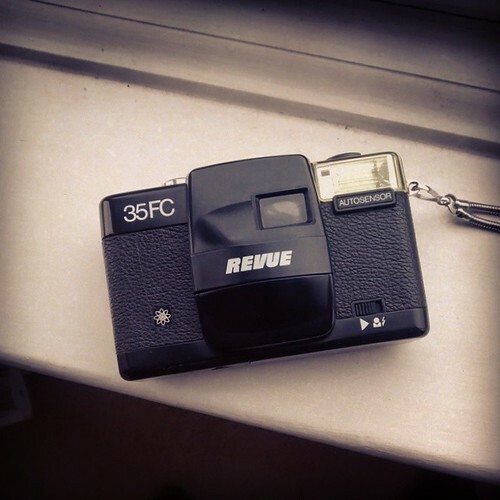 Last year Jörg Krüger posted a shot of his Revue 35FC branded on Flickr. What he commented on was his calculations for setting for each aperture based on dismantling the camera and back calculating the flash setting. Jörg has worked out that the camera settings may (and he’s keen to stress the may bit) and his calculations match neatly in with the widest aperture f/3.5. He got values of f/7 (100 ISO), f/10 (200 ISO) and f/14 (400 ISO) which he suggests you round to f/8, f/11 and f/16. I certainly think his figures make sense. Haking will have counted on negative film’s latitude for exposure. Latitude is an interesting but controversial topic – feel free to google it. 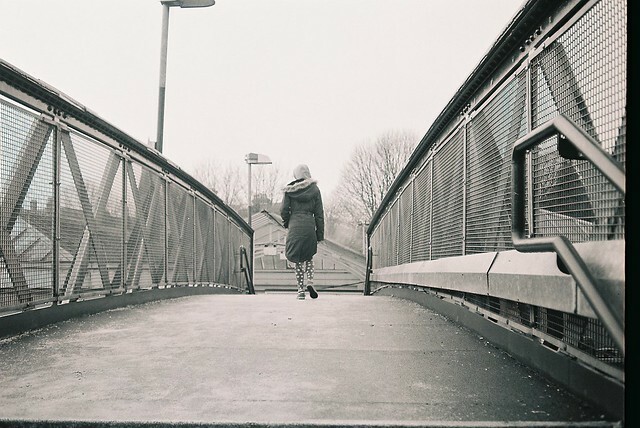 In essence it refers to a films ability to tolerate over and underexposure. 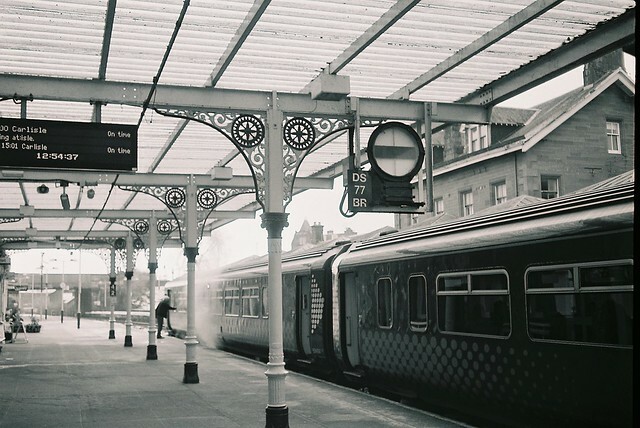 Some people apply it broadly and you’ll often hear folk talking about negative film being able to tolerate 2-3 stops of over exposure and 1-2 for under (less for reversal film). I did a test of this with Agfaphoto Vista Plus 200 > This concept is handy for rank amateurs like myself as it allows you to get away with shots that would have otherwise been pretty duff. Take the above shot. If you’d spot metered the whole shot you’d have found several points of difference on the EV scale ranging from the foreground train to the skylight bridge in the distance but yet you still have detail. I’ll use tolerance in terms of stops for a mo however. Most consumer negative films made in the last couple of decades are felt to tolerate 2-3 stops of over exposure and 1 or 2 under. Jörg’s calculations would put our exposure at a EV of 12 ½ to 13 for all ISO/ASA settings. This makes sense meaning the camera will work in reasonable outside conditions fromm pretty cloudy to sunny. I certainly felt that about EV11-12 was the point the low light warning kicks in and that it tends to overexpose really bright images. There are obvious comparators. The still made Vivitar Ultra Wide and Slim clones (VUWS) is a plastic fixed focus wonder (sometimes erroneously called the poor man’s Lomo or more correctly the Plastic Lomo) recommends 400 ISO film and is fixed at f/11 with 1/125 shutter. Personally I find it tolerates bright scenes better however. But perhaps the Olympus Supertrip is nearer the mark. If you can ignore the plastic and angular 80’s styling underneath mechanically it’s very similar to the Micro 35 except you need to turn on the flash and it comes with a better 3 element Zuiko lens. It’s lens is marginally wider and slightly faster but the same principle apply here. The Supertrip is clinically sharper a lot better in shots due to the lens but ain’t a looker. 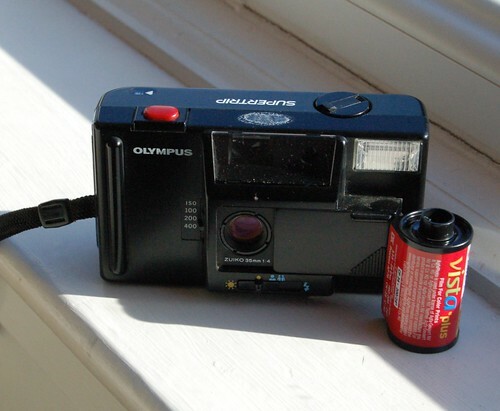 The Supertrip is a typical example of cheap plastic models made by major manufacturers of the time (Kodak 35EF is is sinisterly near identical). Like the Halina they share the same sweet focus spot around 3-5m and do better with faster film and whilst shotwise may be clinically better perhaps lack the gloss that the Halina brings. And on a good day it can deliver. But then again the Micro was made as a Cosina CX look-a-like…. So, how do you adjust the ISO/aperture when you use yours? Or do you just leave it on 400 because of the smallest aperture and therefore largest depth of field and sharpest images? I had a Superheadz Black Slim Devil for a while, and they’re brilliant cameras. Although fixed focus, fixed aperture and fixed shutter, somehow they were/are capable of some pretty dynamic and memorable images. The Halina, whilst very respectable image wise from your photographs, and really cute to hold and use, doesn’t seem to be anything like as capable of memorable images like the Superheadz/UWS cameras. 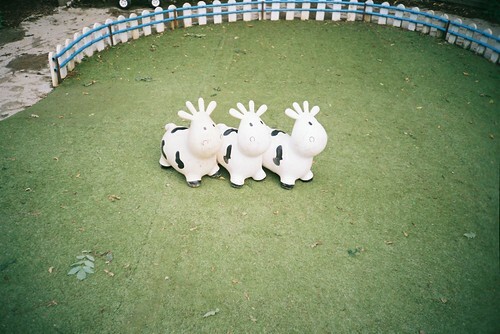 I also have a Minolta AF50 Big Finder (27mm lens) which is very simple, supposedly AF, and again has quite a character to the photographs, enough to put it in the toy/lomo crowd – super shapr in the centre with softness and often vignetting in the corners, and a real charm, strong contrast and character to the photographs. I also recently got a Le Clic Fun Shooter FS30, which is everything fixed again, and supposedly has an intriguingly wide 24mm lens. I’m keen to try it as an alternative to the Superheadz/UWS, as it was much cheaper (99p! ), similarly wide (24mm vs 22mm) but feels significantly more robust! The VUWS and its superheadz etc clones are amazing cameras despite fixed everything and yes IMHO outshoot the micro 35. I get more useable shots per roll and dropping film speed if conditions are fine are no issues where as the Halina really is best at 400 ISO. The VUWS is arguable the best fixed everything camera I’ve ever had. The Goko UF probably edges it in classic image quality for a plastic lens but looks and feels like any dull 80’s glass lensed basic compact. It’s shoots do feel like their taken by a better camera but lack any individuality. It is also ultra rare. The Olympus supertrip featured is nearer the micro 35 in set up but works better due to the sharp zuiko 3 element lens but I suspect perhaps too sharp for what you want.